Everyone knows the image of the snake oil salesman, pitching worthless — often dangerous — tonics, tinctures, and potions to treat any ailment under the sun. What you may not know is that “snake oil” wasn’t just a phrase, or how it and other sham cure-alls ultimately led to the creation of the FDA. As part of its cover story on the largely unregulated dietary supplements industry, our colleagues at Consumer Reports put together a video history of snake oil and other phony medicines that swept the U.S. in the late 19th century. 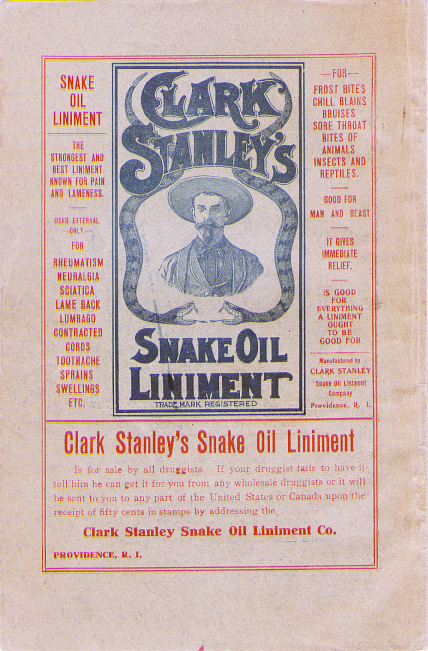 According to Consumer Reports, snake Oil came to the U.S. in the 1800s when Chinese laborers working on the transcontinental railroad used an oil derived from the Chinese water snake. The oil, they believed, would relieve inflammation on sore and tired muscles. Soon, news of the supposed miracle oil spread, leading salesman to believe they could make a hefty profit off the product. But with a high demand for the oil and a lack of Chinese water snakes in the U.S., CR says these shady businessmen made their own version of snake oil. Instead of using Chinese water snakes, they turned to rattlesnakes. However, CR points out these snakes didn’t have the same medicinal properties as the original oil. Still, the salesmen found that when they added alcohol — and a bit of opium — the oil became a hit. During the World’s Fair in Chicago, one of the most popular snake oil producers put on a show: cutting a snake and dipping it into a pot of hot water to extract the oil. While the crowd cheered, CR notes they were unaware that the man — Clark Stanley — didn’t actually use any snake in his product. The popularity and abundance of snake oil and other cure-alls that were popping up around the country drew the suspicious of journalists and others. Soon, reporters were looking into the products — what they were made of and their effects — finding that they caused addiction, overdoses, and deaths. These findings outraged consumers, who felt cheated by the cure-all concoctions. CR reports that the rise of snake oil and other products led to the 1906 Pure Food & Drug Act, as well as the creation of the Food & Drug Administration. But, just because there are rules and an agency to look over these types of products, doesn’t mean people aren’t still selling potentially dangerous products that make unsupported health claims.